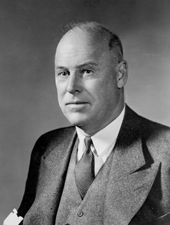 WEEKS, Sinclair, (son of John Wingate Weeks), a Senator from Massachusetts; born in West Newton, Middlesex County, Mass., June 15, 1893; attended the public schools; graduated from Harvard University, Cambridge, Mass., in 1914; engaged in the banking business at Boston, Mass., 1914-1923; served on the Mexican border with the Massachusetts National Guard in 1916; during the First World War served from 1917, as a lieutenant and later as a captain of the One Hundred and First Field Artillery in the Twenty-sixth Division, and was discharged in 1919; engaged in the manufacture of metal products 1923-1953; alderman of Newton 1923-1930; mayor of Newton 1930-1935; member of the Republican National Committee 1941-1953, serving as treasurer 1940-1944; appointed on February 8, 1944, as a Republican to the United States Senate to fill the vacancy caused by the resignation of Henry Cabot Lodge, Jr., and served from February 8, 1944, to December 19, 1944, a successor having been elected; was not a candidate for election to the vacancy; overseer, Harvard University 1948-1954; Secretary of Commerce in the Cabinet of President Dwight Eisenhower from 1953 until his resignation in 1958; chairman, partner, and director of several manufacturing, investment and insurance firms; retired in 1970 and resided in Lancaster, N.H.; died in Concord, Mass., February 7, 1972; interment in Summer Street Cemetery, Lancaster, N.H. Weeks, Sinclair. Richard Bowditch Wigglesworth: Way-Stations of a Fruitful Life. n.p., 1964.